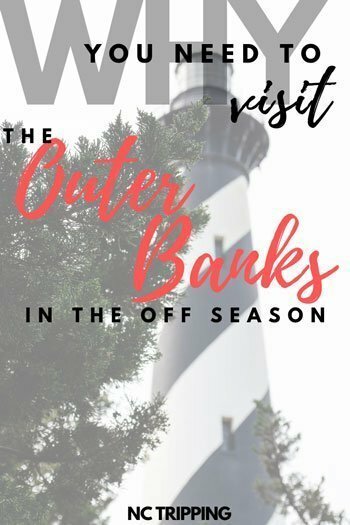 We also included a few of these things to do in our guide to a weekend in The Outer Banks! You can find tons of off season rentals and hotels offered at a discount during these times of year. You can also book a last minute stay with more ease, as demand goes down during the offseason and shoulder seasons. 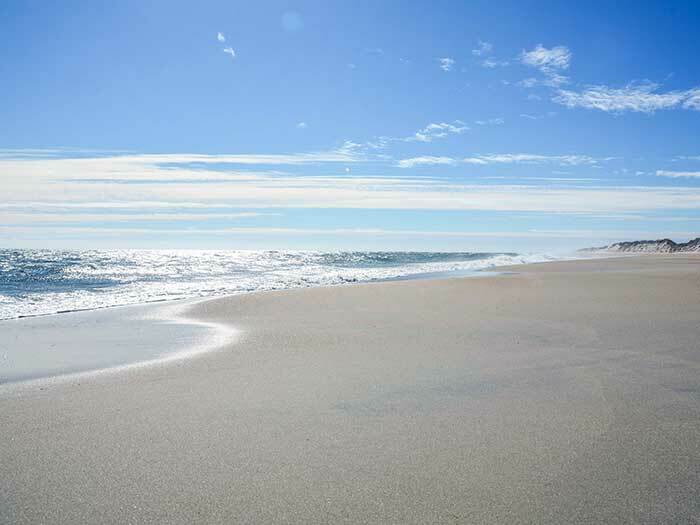 That way, you can enjoy spots like Wright Cottage Court (very family-friendly), Cavalier by the Sea (budget-friendly), and other on-the-water places to stay in The Outer Banks as we have. Tip: If you’re planning on a fall visit, I’d recommend purchasing trip insurance, in case of severe storms or hurricanes. 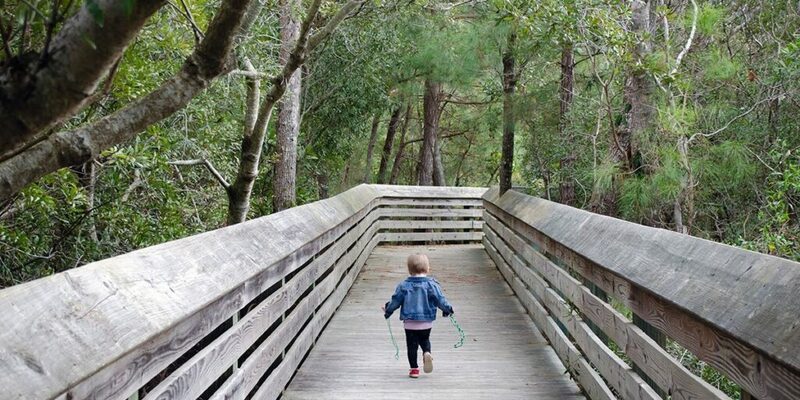 Cooler weather means that it’s the perfect time for a hike, and The Outer Banks has plenty of paths for you to explore. Pea Island National Wildlife Refuge and Jockeys Ridge State Park are two of the more popular spots for getting outside away from the beach. We’ve enjoyed strolls around those, but also Nags Head Woods, which we included in our guide to fall hiking in North Carolina. 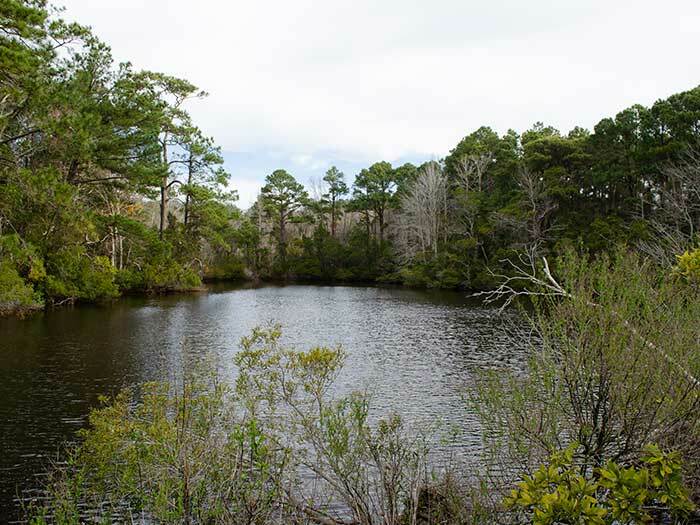 If you’re looking for more reasons to get outside, there’s also Kitty Hawk Woods, Roanoke Island Marshes, and the Currituck Banks Coastal Estuarine Preserve. 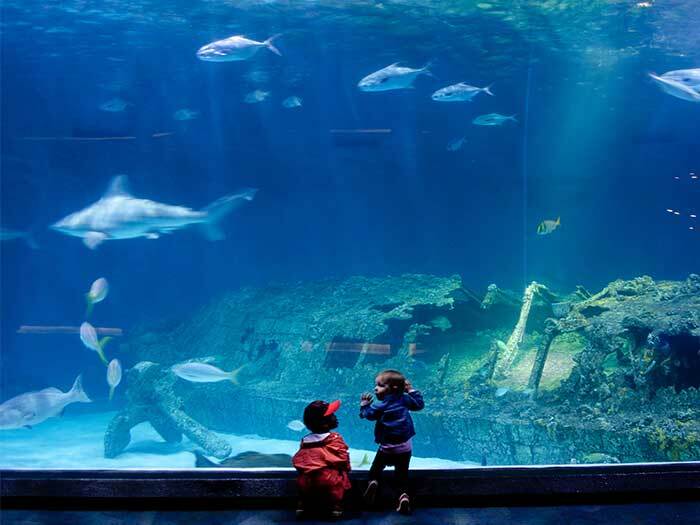 And if the weather isn’t cooperating, you can always visit an aquarium. There’s the NC Aquarium on Roanoke Island, which showcases wildlife found in the “Seven Rivers,” wetlands, and ocean. You can also learn about conservation in their Sea Turtle Assistance and Rehabilitation (STAR) Center. Many folks head to Jennette’s Pier for photo ops, but NC Aquariums hosts an interactive fish display, fishing events, and free programs for Title 1 schools. Note: NC Aquariums do have membership reciprocity agreements in place with participating institutions throughout the US, and more info can be found here. Just be sure to bring your proof of membership and ID. Thankfully, there are some awesome restaurants in The Outer Banks that stay open during the off season. We’re big fans of Waverider’s and think you could easily spend your morning or afternoon there sipping coffee and digging into their delicious menu. 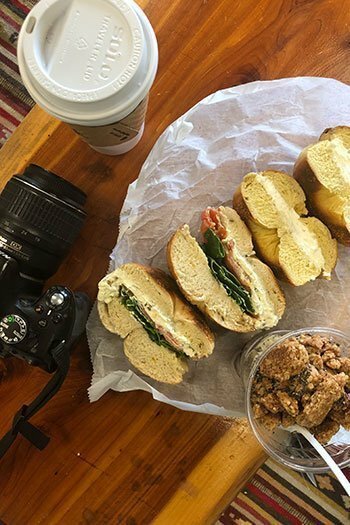 Barrier Island Bagels has the hookup for bagels (real ones, too!). 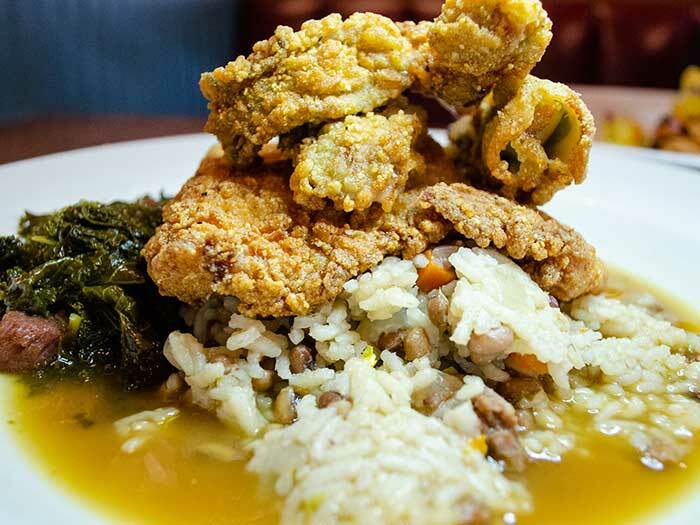 Food Dudes Kitchen mixes Caribbean flavors in with local seafood to create an awesome rotating menu. We were told that we absolutely had to eat at Kill Devil Grill and in a word or four, it did not disappoint! 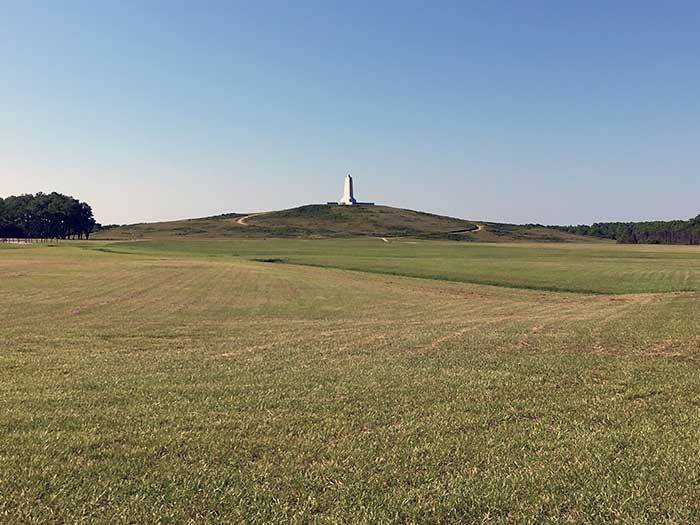 We’ve spent a lot of our time eating in and around Kill Devil Hills, Nags Head, and Kitty Hawk, but we’ve included places to eat throughout The Outer Banks here. If you’re like us and dig beautiful scenic drives, then NC Highway 12 is for you. Head all the way north to Corolla and go even further if you’ve got a 4WD (and a shovel), or head south. And that’s where the real adventure begins. 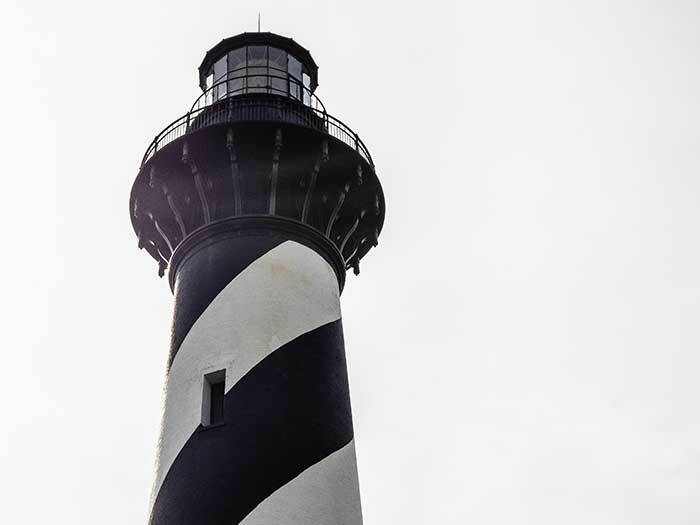 Drive all the way through Cape Hatteras National Seashore, where you can even ferry over to Ocracoke. From there, NC 12 continues after ferrying from Ocracoke to Cedar Island (2-1/2 hours). The road will finally end around Morehead City and Atlantic Beach in Carteret County. Of course, you could just hang out by the beach, especially if the weather is right. Walk alongside the water outside your hotels or rental and relax. There are also tons of birding opportunities during the off season and shoulder seasons, so bring your camera or binoculars along! You can also have more success while shelling since there aren’t as many crowds. Also, you can drive out to one of the many 4WD-accessible beaches and really get away from it all. Yes, I said you can get in the water during the off season and shoulder season, but not just for swimming. These times of year are especially great for fishing, but also for water sports. Wind surfers and kiteboarder flock to spots like Canadian Hole and Kite Point, respectively, and you can come watch if you don’t feel like getting in the water. One of the best off season things to do in The Outer Banks is partake in annual events. We have to start in March with North Carolina’s largest St. Patrick’s Day Parade in Nags Head. At the end of the month, Taste of the Beach is a massive food and wine festival that takes over the area. For more foodie fun, there’s the Outer Banks Seafood Festival in October. As fall turns to winter, visitors will descend upon WinterLights at the Elizabethan Gardens on Roanoke Island (weather-dependent). And of course, you can’t forget about the Celebration of the Wright Brothers First Flight in December. Is there an event that you’d like to add to the mix? Let us know in the comments section! 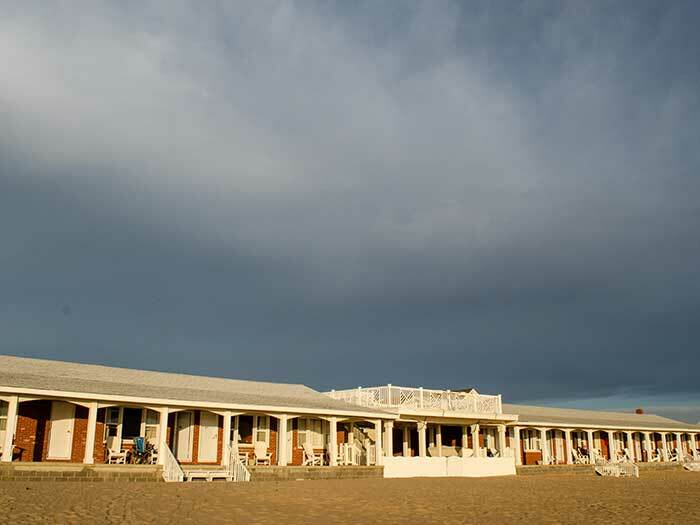 After all this exploring The Outer Banks, you’ll want to find a nice place to grab a drink. Lost Colony Brewery and Cafe will fill you up with good food and beer (hint: order wings). Just down the street from them, OBX Distilling will show you around. They’ll share their expertise on the area and its spirits, plus a taste of their award-winning rum (and delicious pecans). 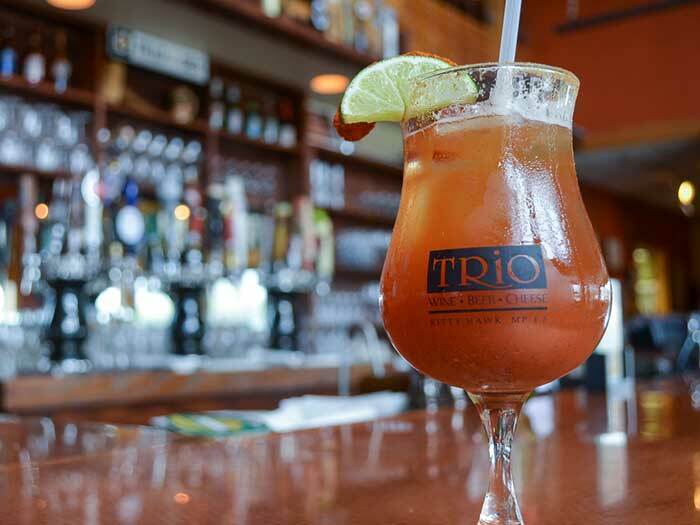 In Kitty Hawk, TRiO mixes a beer, wine, and cheese market with an inviting restaurant whose amazing lunch and dinner menus are worth multiple return trips. 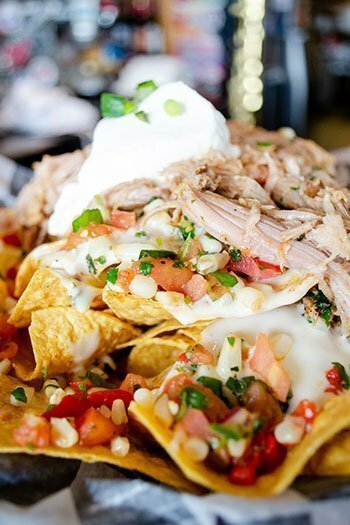 We’ve also mentioned Lost Colony in our NC Brewery Guide and TRiO in our guide to OBX restaurants. 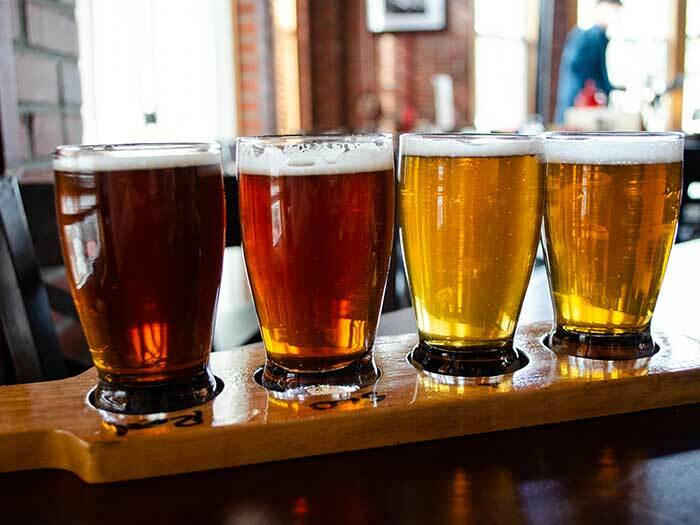 Do you have a favorite place to grab something to drink in The Outer Banks? We’d love to know about it. 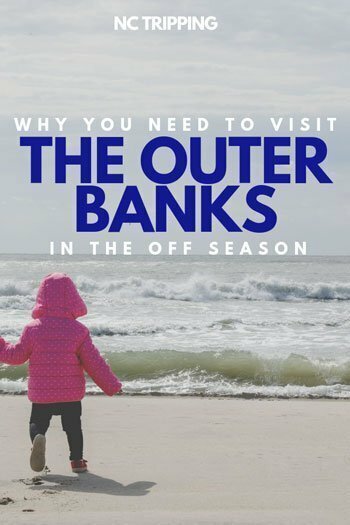 Now that you see there are more than enough off season things to do in The Outer Banks, what do you think now? You know how we feel, but we’d love to know your thoughts. 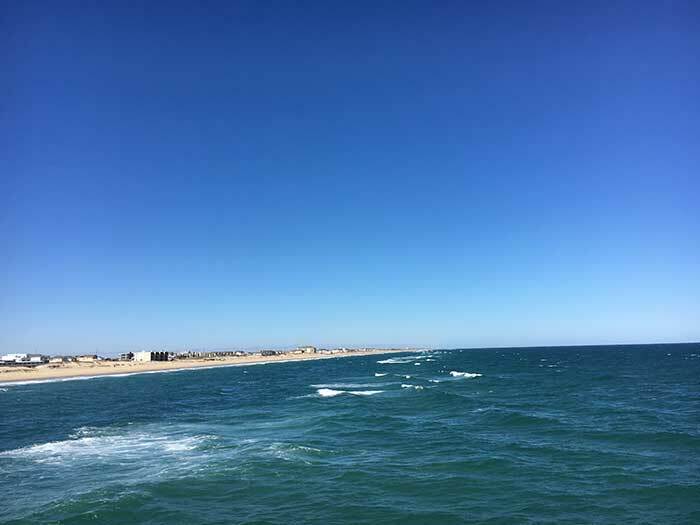 Also, if you’ve visited The Outer Banks during the not-busy spring, fall, or winter, we’d love to know what you thought of your time there. Special thanks to The Outer Banks Visitors Bureau for providing us with complimentary accommodations, admission, and meals throughout our stay. All opinions within this article are our own. This entry was posted in Travel and tagged Kill Devil Hills, Kitty Hawk, Manteo, Nags Head, The Coast, The Outer Banks.